I love baking with finely ground semolina. It has a very delicate taste and adds an interesting sandy texture that is more subtle and lighter than cornmeal. Made from fine durum wheat, it's a common ingredient in Middle Eastern, Indian and North African desserts and primarily used for making pasta in Italy and the United States. 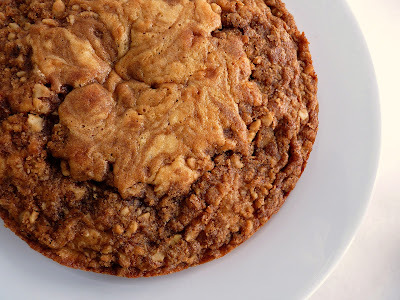 These cookies are from Mark Bittman. I've never tried any of his recipes before so I thought I'd begin with this one since semolina is the star along with brown sugar and salt. Crispy, crunchy, crumbly, sweet and salty, these cookies make the most of the combination of all these ingredients. 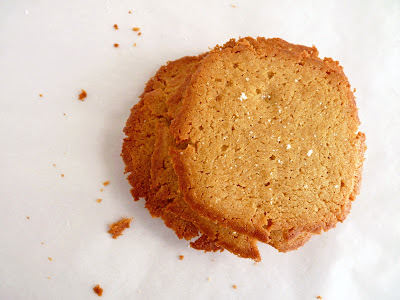 The brown sugar lends a hint of butterscotch flavor, the edges caramelize nicely and the salt brings that nice touch of bling at the end of your bite. As it turns out, the flavors in Bittman's recipe are great but his cookies are a tad too rich with butter for me and fairly greasy. There's 8 oz of butter to 1 1/2 cups of dry ingredients, which is a pretty high ratio of fat. So I cut back the 8 oz to 6 oz and baked them again. 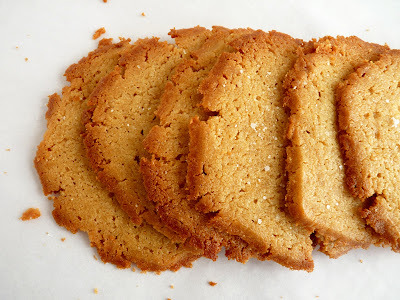 I also slightly changed the ratio of semolina to flour to smooth out just a tinge of grittiness and added some vanilla, which I think really enhances the luscious flavor. I've presented Bittman's recipe here with my revisions in brackets. If you're game to try a new and simple but different textured cookie, pick up some semolina and give these little gems a go. - I buy semolina in bulk, which is very inexpensive. Check your local grocer or bulk item market. Bob's Red Mill carries a high quality and more expensive product online as does King Arthur, although it appears they have a coarser grind. - The sea salt sprinkle is a must!! - The dough is very soft and definitely needs a good chilling before slicing. 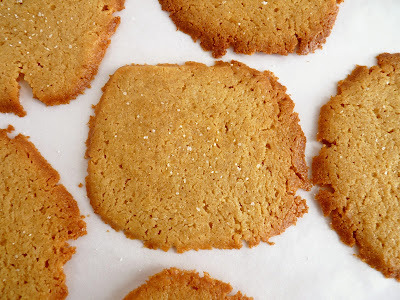 - The cookies spread out and flatten so be sure to leave about 1 1/2” between them, baking 12 to a standard baking sheet. - The cookies are soft coming out of the oven but firm up and crisp as they cool. - Bear with me as there appears to be frequent and ongoing changes to the new text editor from Google. Today it's not accepting a recipe ingredient list format without double spacing. And I just got an email from them telling me my blog will be eliminated in May because I haven't logged in since 2007. GAH. Cream the butter and brown sugar until well combined. Add the egg yolk and mix thoroughly. Add the vanilla if using and combine. Whisk together the semolina, flour and the 1/4 t salt. Add to the creamed mixture and beat just until the dough starts to hold together. Scrape down the bowl to make sure all the ingredients are incorporated and thoroughly combined. Turn the dough out onto a piece of parchment and roll it into a log. Wrap tightly with plastic wrap and refrigerate for at least an hour or until the dough is well chilled and firm enough to cut into slices and still hold their shape. Preheat oven to 325 degrees. Prepare two baking sheets with parchment paper or silpats. Remove dough from the refrigerator. Cut into 1/4" slices and place them on the baking sheets about 1 1/2" apart. 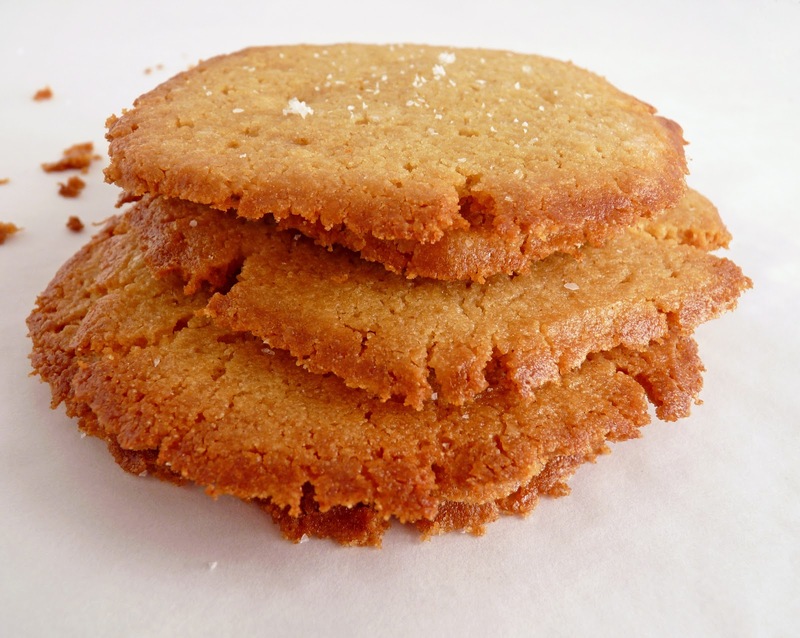 Lightly sprinkle the cookies with a tiny pinch of sea salt. Bake for about 15 - 20 minutes or until browned with the edges taking on more color, rotating the baking sheets top to bottom and front to back about half-way through. Let the cookies cool on the pan to firm up before removing them. Although we’ve had our share of April showers, there’s been a respite of a few sunny days all in a row. 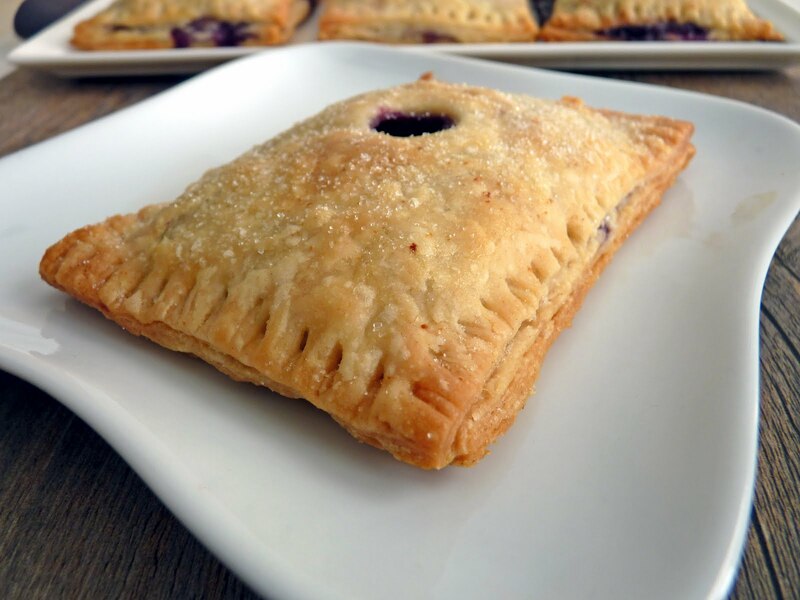 And because sunny spring days always call out for some sort of fruit pastry, my ambition went straight to the thought of fruit turnovers when I saw these beautiful blueberries. And since I had some ricotta left over from making Baked Lemon Ricotta Doughnuts, I thought it would be perfect to make blueberry turnovers with that great lemon ricotta filling. This dough is a great buttery pastry that crisps nicely and is pretty easy to work with once it’s been rested and chilled. 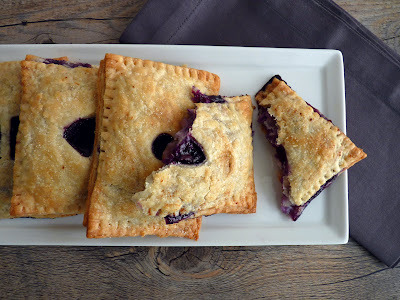 The gooey blueberry filling just needs a quick and easy simmer on the stove with some sugar and lemon. I love the combination of blueberries and star anise, so I added a half-piece to the mix. 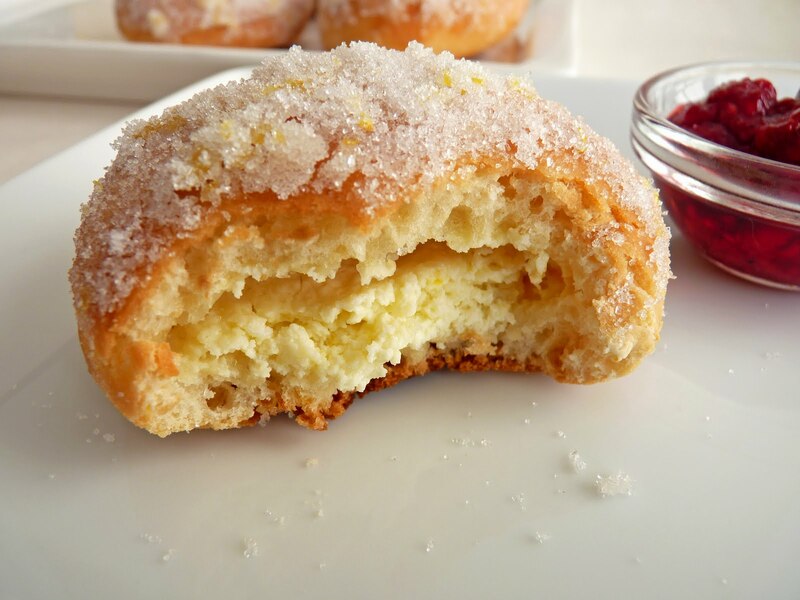 The lemon ricotta filling is simply sweetened with sugar and brightened with a pop of lemon. It adds a nice creamy richness to the turnover. If you happen to spot some blueberries in your market, don’t resist the temptation to celebrate spring with a delicious bite of fruit turnovers. They are the best indulgence, rain or shine. - The butter and the water for the dough should be very cold. - Use a fork to stir the water into the flour mixture. Keep stirring until the dough comes together in large clumps. Gather with your hands and place on a piece of plastic. Press the dough together and wrap tightly. Once the dough is mixed, handle it very little in order to avoid activating the gluten in the flour, which will toughen the pastry. - If the dough seems too loose or doesn’t cohere, press the heel of your hand into it and push it against the work surface to smear it. Use a bench scraper or metal spatula to scrape up the smeared dough and fold it back on itself. Gather and shape into a disc. Wrap tightly and chill. - I separate the dough into two packets to make it easier to handle when rolling out. - Simmer the blueberries on low heat to preserve the full flavor of the fruit. If you don’t care for star anise, try cinnamon or omit the spice. - I use a small cookie scoop to portion the fillings. - Make the turnovers any size or shape you want. Just be sure to roll the dough out to a 1/8” thin sheet so it bakes thoroughly and evenly. Keep your eye on the baking time. To prepare the dough, whisk together the flour, sugar and salt in a bowl. Add the small pieces of butter and toss them with your hands. Coat each piece of butter thoroughly with flour as well as your hands. Pinch each piece of butter flat between your fingers, working quickly so as not to warm the butter. Keep tossing the mixture to be sure each piece of butter is coated well with flour. Add the cold water and stir with a fork until the dough comes together in moist clumps. Press together and place on a work surface. Divide the dough into two equal portions. Gently pat each one into a disc and wrap tightly in plastic. Chill the dough at least 30 minutes. To prepare the blueberry filling, place the blueberries in a saucepan. Add sugar, water and star anise. Simmer on low heat for 2 – 3 minutes. Dissolve the cornstarch in the water and stir into blueberries. Add the lemon juice. Cook for another 2 – 3 minutes, stirring to keep from scorching. Remove the star anise and set aside to cool and thicken. Stir together the ricotta, sugar, lemon juice and zest. Add the egg yolk and blend thoroughly. Place in the refrigerator to chill. When you’re ready to roll out the dough, remove one packet from the refrigerator and rest on a lightly floured piece of parchment paper for a few minutes so it can soften enough to prevent cracking. Roll out the dough to a 9 1/4” x 12 1/4” rectangle, gently lifting and moving the dough after each roll and keeping the parchment and dough lightly floured as needed. Trim the edges and cut into nine 3” x 4” rectangles. Brush off any excess flour. Lift the parchment onto a baking sheet and place in the refrigerator. Repeat with second packet of dough. Cut out steam vents on these nine pieces to form the top half of the turnovers. Chill the pastry thoroughly. 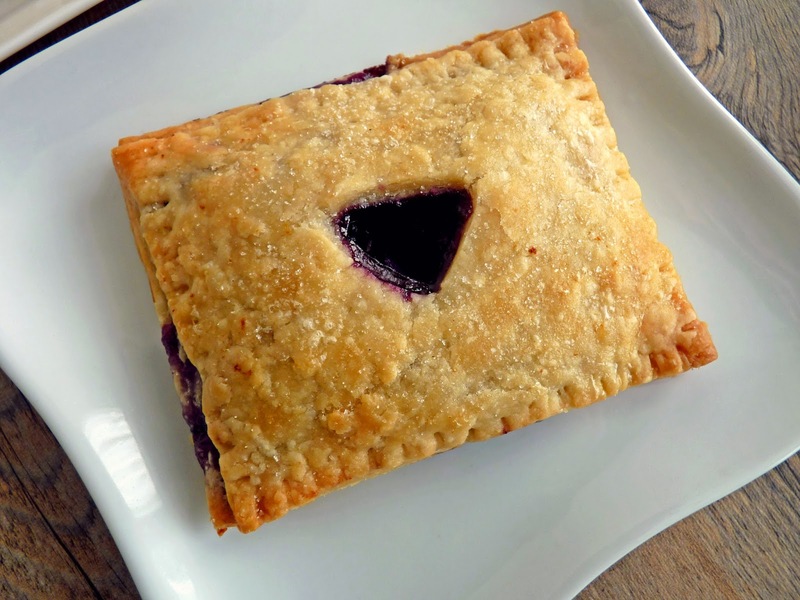 Remove the bottom half pastry rectangles from the refrigerator. Place 1 heaping tablespoon of lemon ricotta filling on each rectangle and spread evenly, leaving a border on all sides. 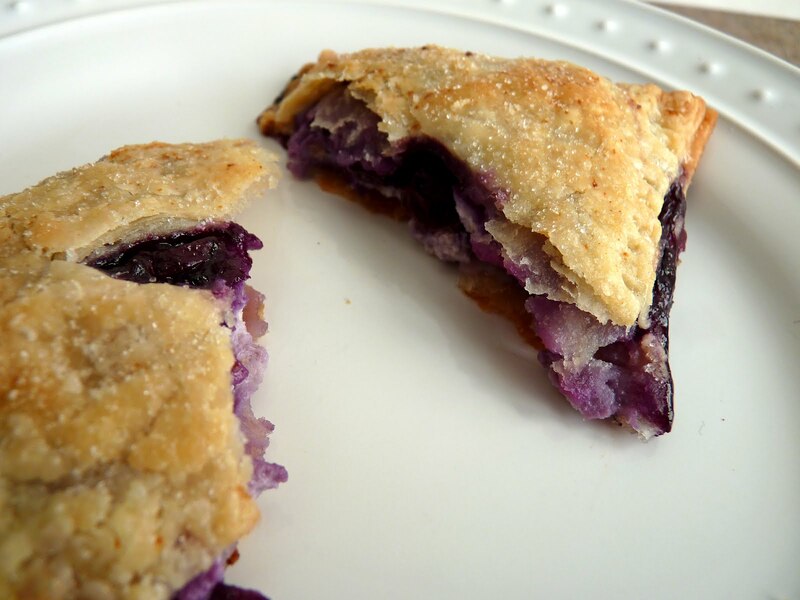 Top with 2 tablespoons of blueberry filling. Brush the border of each rectangle with water.Remove remaining top half pastry rectangles from the refrigerator and place on top of filling. Use a fork to press and seal the edges. Brush the turnovers with melted butter and dust with a light sprinkle of sugar. Bake for about 20 - 25 minutes or until the dough is crisp and browned and the fruit is bubbling. Thanks to some sort of luck from the software gods and a ton of patience, I was able to get into my file today to try and rebuild the content using the new Blogger templates. It's not exactly the same but close enough for now. You should now have full access to the archives and the Recipe Index. I want to thank everyone for all the really kind notes left in the comment section and via email. You are all very much appreciated. It's really good to know we can carry on together with our pastries and desserts. As you may know, Blogger, the blogging platform I use to publish pastry studio, was bought out by Google a while back. Google is now in the process of switching over to a whole new platform with a whole new set of Blogger templates and functions. Unfortunately, somewhere in the shuffle it ate a large portion of my blog. I’ve tried to retrieve my old template and all the previous category and design pages, but so far I’ve been unable to even get back into either the old system or into the new one, which informs me I’ll lose all my archived material if I choose to use their new system. What this means for my readers is there is no access to the Recipe Index or the "categories" pages and no way to sign up for email or an rss feed at this time. I think I will still be able to post in this established blog space when Google finishes their upgrade. As you can imagine, I’m more than beyond frustrated. Please accept my apologies for this mess. I hope to sort it out someday soon. And thanks again for being such great supporters of my efforts here. I so appreciate all of you. It may be a bit surprising to learn that marble cakes have been around since the Victorian era when embellishment was the order of the day. Along with checkerboard cakes, they have great visual appeal and present a contrast of flavors all in one cake. There's nothing terribly complex about making them. It’s easy to achieve the marble effect by mixing a neutral cake batter, adding another contrasting ingredient like chocolate to a portion of it and then layering and streaking the batter before baking. This Marble Spice Cake harkens back to the late 1800s in America when the marbling was usually accomplished by flavoring some of the cake batter with molasses and spice. Since I love to work with spice, I always welcome the chance to include a good blend in my recipes. I also like the interest that just a little bit of molasses brings to the whole flavor profile. 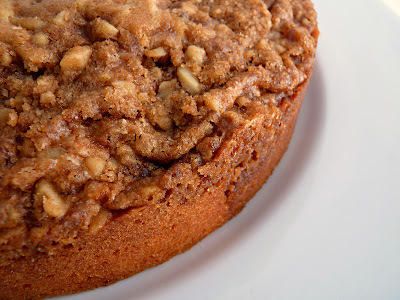 To finish the cake, I decided to garnish it with a nut streusel sprinkled along the perimeter just to add a bit more flavor and texture contrast. 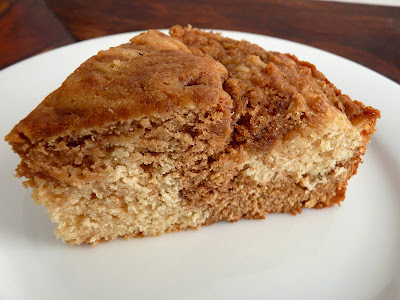 I’d put this cake in a category of pastries that would make a nice choice for a brunch table or whenever a simple old fashioned cake is desired. It's certainly not frilly but serves as a delicious reminder that some of the best pastries can be made with just a few basic ingredients and minimal effort and flair. - To toast the walnuts, spread them in a single layer on a baking sheet and place in a 350 degree oven for about 10 minutes. They should brown slightly and give off a slight toasty aroma. Set aside to cool. - Pecans would make a nice substitution. 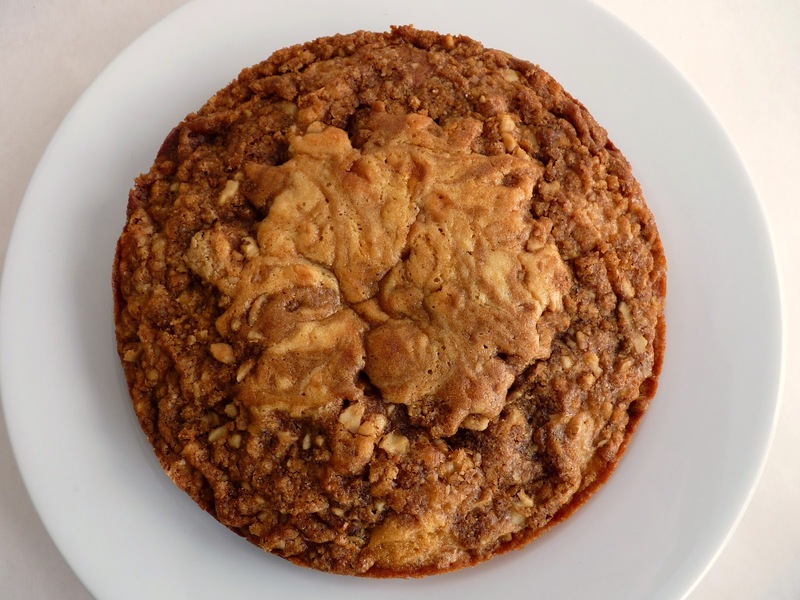 - Cake flour is made from softer wheat and has about 6% - 8% protein, which produces a more tender texture. All-purpose flour has a 10-12% protein content. You can make your own cake flour with this method: 1 cup sifted cake flour can be substituted with 3/4 cup sifted all-purpose flour plus 2 tablespoons cornstarch. - I used a large ice cream scoop to portion the cake in the pan. - Once the batter is in the prepared cake pan, make just a few swirls with a knife for a marble effect. It’s easy to overdo this and blend too much of the batter. - This cake would also make a nice dessert served with a good vanilla ice cream. Preheat oven to 350 degrees. Lightly grease an 8” cake pan and line the bottom with parchment. For the walnut topping, place the toasted and finely chopped walnuts in a bowl. Add the dark brown sugar and flour and toss together. Cut the butter into small pieces and add. Using your fingertips, pinch and press the butter into the nut mixture until it clumps together in small and medium sized bits. Set aside. Sift the flour with the baking powder and salt. Combine the milk and vanilla. Cream the butter and sugars until smooth and light, about 4 minutes. Scrape down the bowl and add the eggs one at a time, mixing until the egg is completely incorporated before adding the next. Scrape down the bowl and add the flour mixture and milk mixture to the batter alternately in 3 parts, starting and ending with flour. Beat on medium low speed until smooth. Pour half the batter into a separate bowl and stir in spices and molasses. Scoop portions of the plain batter in the prepared cake pan leaving gaps to fill in with the spice batter. Take a knife and swirl a few figure 8s through the batter. Sprinkle the walnut topping around the border. Bake for about 28 – 30 minutes or until a tester inserted into the center comes out clean. Cool the cake pan on a wire rack for 10 minutes. Run a thin knife around the edges and invert the cake. Remove the parchment and invert the cake right side up. Cool completely. As we enter the beauty of spring, there are certain pastry ingredients that for me are iconic of the season. Lemon is certainly one of them and ricotta seems to belong there as well. Along with all the fruit that’s about to arrive, lemon just really evokes the desserts I gravitate toward at this time of year. Over the last few weeks I’ve been getting back into playing with yeast and this recipe looked like something fun to do for a spring table. These are yeast doughnuts that have a simple lemon ricotta filling just sweet enough to make the pastry special. 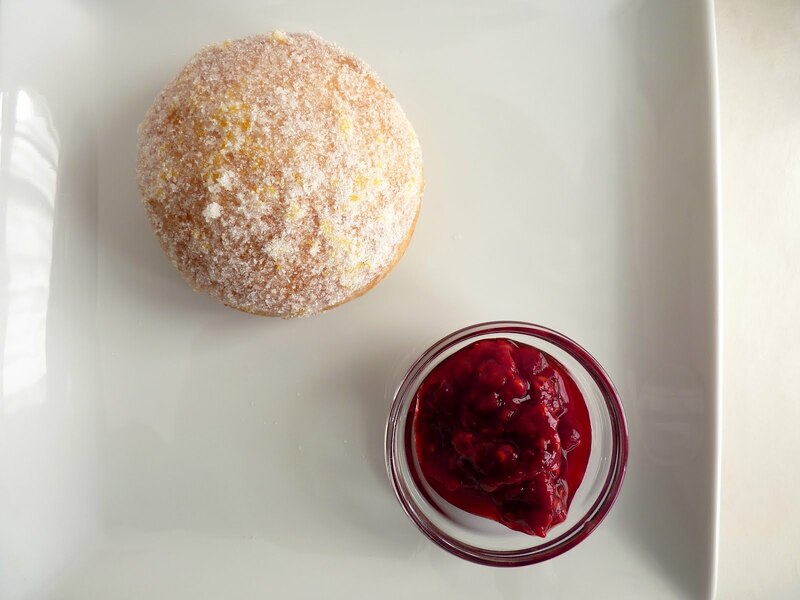 The other thing that distinguishes these doughnuts is that they are baked rather than fried. They are nevertheless puffy, delicious, much lighter than expected and very tender. And they certainly make spring all the brighter. Preparing these little pastries does require some planning. There are two proofing sessions but once they have properly risen, they bake off in just 10 - 12 minutes. A roll in some melted butter and the sprightly mix of sugar and lemon zest complete the package. Great rustic textures and flavors for these long sunny days. - You’ll need a total of 4 lemons for all three elements: the dough, ricotta filling and the lemon sugar. - I always mix yeast doughs by hand but I've provided the recipe directions for mixing in a stand mixer. - To test if your yeast dough has proofed long enough in the first rise, gently press two fingertips about 1/2" into the dough. The indentations should remain or only come back out minimally and very slowly. For more yeast troubleshooting, see the Red Star guide. Check out the entire site. Lots and lots of clear information there about working with yeast. 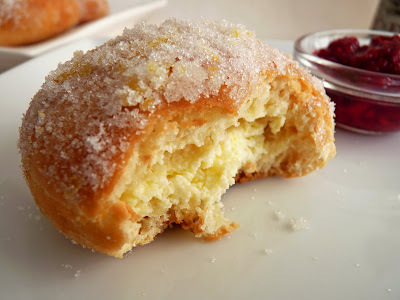 - The recipe says to mix the ricotta filling in a food processor but I think mixing it by hand just enough to combine the ingredients results in a less runny filling in addition to chilling it thoroughly. - I used a small truffle scoop to portion the filling. It’s tempting to portion more than recommended but try to stick to a heaping teaspoon or the ricotta will seep out as you try to seal them. 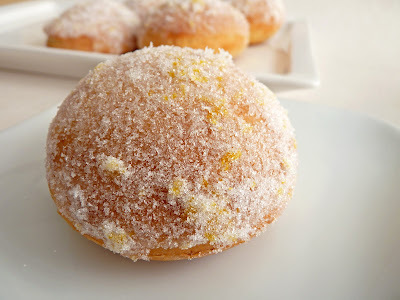 - I used a brush to coat the doughnuts in warm butter and then rolled them in the lemon sugar. - I served the doughnuts with fresh raspberries macerated in a bit of sugar. Prepare one large or two medium sized baking sheets with parchment paper or silpats. Combine flour, sugar, yeast and lemon zest in the bowl of an electric mixer fitted with a dough hook and mix to combine. Whisk together warm milk, room temperature buttermilk and eggs and the melted butter. With the mixer running, add the liquids to the flour mixture, then mix on medium speed until dough is smooth and elastic (about 4-5 minutes). Shape into a ball, place in a lightly oiled bowl, cover with plastic wrap and stand in a warm place until doubled in size (1 – 1 1/2 hours). For the lemon ricotta filling, whisk together ricotta, sugar, lemon zest, lemon juice and egg just until smooth. Transfer the mixture to an airtight container and chill for at least 1 hour. Gently punch down the dough and turn onto a lightly floured surface. Roll the dough out to a very thin sheet (5mm thickness). Cut out 48 rounds using a 3” cutter. Place a heaping teaspoon of lemon ricotta filling in center of 24 rounds. Brush edges with milk, cover with the remaining rounds and press firmly to seal the edges. Transfer to baking sheet(s), cover and stand in a warm place for 1 – 1 1/2 hours. For the finishing garnish, melt the 4 oz of butter and set aside. For the lemon sugar, place the sugar and lemon zest in a bowl of a food processor and pulse until the sugar is aromatic. Pour into a bowl and fluff with a fork or a whisk. Bake the doughnuts 10 – 12 minutes until the bottoms are golden. Dip hot doughnuts immediately in the melted butter and then toss in lemon sugar. Serve warm.